The Joint Declaration of Pope Francis and Patriarch Kirill, also known as the Havana Declaration, was issued following the first meeting in February 2016 between Pope Francis, who as the Bishop of Rome is the pontiff of the Catholic Church, and Patriarch Kirill of Moscow, Patriarch of Moscow and all Rus', Patriarch of the Russian Orthodox Church (ROC), the largest of the Eastern Orthodox churches. This was the first time leaders of the Roman Church and the Moscow Patriarchate had met. While the meeting was also seen as a symbolic moment in the history of relations between the Catholic Church and the Orthodox churches as a community, which had split in the Great Schism of 1054, centuries before the Moscow Patriarchate was constituted, it was not expected to lead to any immediate rapprochement between them. The 30-point declaration contains a joint call by the two church primates for an end to the persecution of Christians in the Middle East and to wars in the region, expressing their hope that the meeting might contribute to the re-establishment of Christian unity between the two churches. A range of other issues are mentioned in the declaration, including atheism, secularism, consumerism, migrants and refugees, the importance of marriage and the family, and concerns relating to abortion and euthanasia. According to the ROC leadership′s public statements made prior and after the Havana meeting, while the document stresses that both churches share the Tradition of the first millennium of Christianity, the discussion during the meeting did not attempt to mend any of the persisting doctrinal and ecclesiastical differences between the two churches. The Declaration however includes statements about Eastern Catholic Churches in line with the Balamand declaration as well as the conflict in Ukraine. The Ukrainian Greek Catholic Church expressed disappointment and Ukrainian Orthodox Church of the Kyivan Patriarchate criticised the latter. The Great Schism of 1054 split Christianity between Greek East and Latin West. Attempts were made over the subsequent centuries to heal the rift, such as the 1274 Second Council of Lyon and the 1439 Council of Florence, but these failed. More recent attempts to foster closer relations between the churches included the Catholic–Orthodox Joint Declaration of 1965 following the 1964 meeting between Pope Paul VI and the Ecumenical Patriarch Athenagoras I of Constantinople in Jerusalem. Following that meeting and declaration, a number of meetings, visits and symbolic events had taken place involving Catholic and Orthodox leaders (including visits by Pope John Paul II, and especially between several popes and Bartholomew I of Constantinople), but never a meeting between a Pope and a leader of the Russian Orthodox Church. The first time a Pope visited a predominantly Eastern Orthodox country was in 1999 when Pope John Paul II visited Romania. Since 1980, regular plenary sessions of the Joint International Commission for Theological Dialogue Between the Catholic Church and the Orthodox Church, the latter being led by the Church of Constantinople, had been held. Within the communion of the autocephalous (administratively independent) local (national) churches of Orthodoxy, the Ecumenical Patriarch of Constantinople – based in what is now Turkey's Istanbul – is recognized as the bishop who enjoys primus inter pares status, albeit having no direct administrative powers over the other Orthodox churches. The Russian Orthodox Church (Moscow Patriarchate) which became autocephalous near the end of the 16th century is considered the largest denomination of the local Orthodox churches; it has close ties with the Russian state, thus according a geopolitical significance to a meeting of its Patriarch with a pope. The decentralised nature of Orthodoxy meant that such meeting could not have direct significance for pan-Orthodox issues. Two weeks earlier, the leaders of the Orthodox churches, including Kirill, met in Chambésy, Switzerland, to make final preparations for a historic Great and Holy Council of the Orthodox Church, re-scheduled for June 2016. Two years of secretive planning and months of detailed negotiation were necessary to arrange the meeting between Francis and Kirill. Francis was willing to meet Kirill, having said in November 2014: "I'll go wherever you want. You call me and I'll go." Agreement from the Russian Orthodox side was complicated over the church's close ties to the Russian state and international tensions over Russia's intervention in Crimea and Ukraine. The pre-meeting announcement from the Moscow Patriarchate stated that they had agreed to "put aside internal disagreements" in order to focus on the plight of Christians being persecuted. Cuba, a location that was significant to both sides, provided the requirements for a neutral meeting place as neither Rome nor Moscow would have been suitable. The meeting, made possible by the timing of both leaders' visits to the region, was announced a week in advance on 5 February 2016. The meeting took place on 12 February 2016 in a VIP room at José Martí International Airport near Havana, Cuba. Francis arrived at 2 pm local time, and the two leaders embraced and kissed. A 2-hour private meeting was followed by the signing of their joint declaration, which had been prepared in advance. Kirill was in Havana on an official visit as part of a tour of the region, including visits to Brazil and Paraguay. Francis' airplane arrived at the airport on his way to his tour of Mexico. Cuban dignitaries attending the occasion included President Raúl Castro, Cardinal Jaime Lucas Ortega y Alamino (Archbishop of the Roman Catholic Archdiocese of San Cristóbal de la Habana) and Archbishop Dionisio Garcia Ibanez [es] (of the Roman Catholic Archdiocese of Santiago de Cuba). The meeting itself was held in a private room and attended by translators and by the aides of the two leaders, in addition to Cardinal Kurt Koch, president of the Pontifical Council for Promoting Christian Unity, and Metropolitan Hilarion Alfeyev, chairman of the Department of External Church Relations for the Moscow Patriarchate. At the end of the meeting, there was an exchange of gifts. Francis gave Kirill a chalice as well as a reliquary of the 9th-century Saint Cyril (buried in Rome). Kirill gave Francis a copy of the icon of the Our Lady of Kazan. [a] Other presents exchanged were a Spanish-language translation of Kirill's book Freedom and Responsibility (2011) and a Russian-language translation of Francis's encyclical Laudato si' (2015). Speaking to news media several days after the meeting, Patriarch Kirill said, citing as the reason ″powerful forces″ opposing such meeting (apart from the fearful Orthodox faithful), that the meeting had had to be prepared in strict secrecy; he also stressed that not a single theological issue had been discussed. The joint declaration was published by the Vatican in Italian, Russian, English, German, French, Spanish, Portuguese and Arabic. The Russian Orthodox Church published it in Russian, English, Italian, French, Spanish and Ukrainian. It consisted of 30 numbered sections on a range of topics. The first section of the declaration gives thanks for this meeting "the first in history" and refers to the leaders as "brothers in the Christian faith". Sections 2 and 3 refers to their meeting place of Cuba as "the crossroads of North and South, East and West", and expressed joy at the growth of Christianity in Latin America. Sections 4–6 expresses their views on their shared spiritual tradition ("the first millennium of Christianity") and their hopes that their meeting "may contribute to the re–establishment of this unity willed by God". Sections 7–21 refer to "the challenges of the contemporary world". Issues raised include the persecution of Christians in the Middle East and North Africa; the impact of civil war, chaos and terrorist violence; the exodus of Christians from Syria and Iraq; and the suffering experienced by the faithful of other religious traditions. The declaration refers to the renewal of the Christian faith in Russia and Eastern Europe and the "breaking of the chains of militant atheism", the rise of secularism, consumerism, inequality, migrants and refugees, and the place of Christianity in the process of European integration. Further sections emphasise the importance of the family, of marriage between one man and one woman, and their concerns relating to abortion, euthanasia, and "biomedical reproduction technology". The issues of the schism within the Orthodox community in Ukraine, the conflict between Ukraine′s Catholics and the Orthodox, and the political situation in Ukraine are raised in sections 25–27. The closing sections call on Catholics and Orthodox to "work together fraternally in proclaiming the Good News of salvation" and to "give shared witness to the Spirit of truth in these difficult times". The declaration concludes with a prayer to Mary, who is invoked by the names of the "Blessed Virgin Mary" as well as "Holy Mother of God". The meeting was characterised by news media commentators, who were largely uninformed of the pivotal facts concerning the history of Christianity in Russia and tending toward sensationalism,[c] as being "historic", "richly symbolic", and as the "meeting of the millennium". Analysts also opine that the meeting had a geopolitical dimension, being about rivalries among Orthodox leaders, long-standing tensions within Ukrainian Orthodoxy, and about Russian President Vladimir Putin asserting Russia's influence on the world stage, motivated by his actions in Syria and Ukraine. Overall, the meeting was "not expected to lead to any immediate rapprochement between the Eastern and Western Churches". Kirill has faced criticism over his policies that have brought the Russian Orthodox Church closer to the Russian state. In the 2012 Russian presidential election he supported Vladimir Putin, likening Putin's presidency to "a miracle from God". Yury Avvakumov, assistant professor of theology at the University of Notre Dame, describes the Moscow Patriarchate as "an instrument of Russian international policy [and] an effective transmitter worldwide of the political interests of the Russian rulers." The view that the meeting was motivated by internal Orthodox politics was expressed by George Demacopoulos, Greek-Orthodox chairman of Orthodox Christian studies at Fordham University in New York: "This isn't benevolence. It's not a newfound desire for Christian unity [...] It is almost entirely about (Kirill) posturing and trying to present himself as the leader of Orthodoxy." Similar views are expressed by Borys Gudziak (Ukrainian Catholic Eparchial Bishop of Paris), who states that "the two protagonists in this drama come to it bearing different legacies. Francis is the leader of a billion Catholics and is the single most respected moral authority in the world. Kirill is the head of the Russian Orthodox Church, which is still limping from a century of persecution and still looking for its moral voice in post-Soviet Russian society." Gudziak also highlighted the internal tensions in Orthodoxy, and that an independent Ukrainian Orthodox Church would greatly reduce the power of the Russian Orthodox Church. [d] He pointed out the tensions arising from the impending Pan-Orthodox council in June, the first to be held in centuries. [e] In addition to this, Patriarch Kirill may face opposition from conservative groups in Russian Orthodoxy opposed to closer ties with the Catholic Church. US Jesuit priest Robert F. Taft credits the new approach by Francis for creating the conditions needed for the meeting, opining that "Russia is coming to understand that the Catholic Church sees them as a sister church, not as someone who separated from the only real Church." The New York Times states that for Francis, "the meeting was an ecumenical and diplomatic coup that eluded his predecessors", but that he could face criticism for indirectly providing support for the Russian military intervention in Syria and Ukraine. 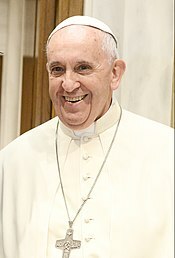 The Associated Press report states that the meeting "cemented Francis' reputation as a risk-taking statesman who values dialogue, bridge-building and rapprochement at almost any cost", but adds that he "has also come under criticism for essentially allowing himself to be used by a Russia eager to assert itself". When asked about the possibility of being the first pope to visit Russia and China, Francis pointed to his heart and said: "China and Russia, I have them here. Pray." According to The Economist, the meeting was a diplomatic victory for Russia's government: "The [pope's] meeting with his Russian counterpart drew Francis deep into geopolitics, and led him to condone Russia's foreign policy and critique the West's in ways that infuriated some of the Catholic church's supporters". Major Archbishop Sviatoslav Shevchuk, of the Ukrainian Greek Catholic Church, says he was disappointed and his church members felt "betrayed by the Vatican" over the declaration's stance regarding Ukraine. Nonetheless, Shevchuk asks, "all not to rush in judging [Francis], not to remain on the reality level of those who expect only politics from this meeting and want to exploit a humble pope for their human plans at all costs. If we don't enter into the spiritual reality of the Holy Father and do not discern together with him the action of the Holy Spirit, we shall remain imprisoned by the prince of this world and his followers." The nuncio to Ukraine, Claudio Gugerotti [it; uk], called for patience and indicated that the declaration was a compromise statement. The Ukrainian Orthodox Church of the Kyivan Patriarchate also criticised the declaration; it states that the declaration ignores the opinion and position of the Ukrainian Greek Catholic Church. It also protests that the declaration had not stated that the War in Donbass was a Russian military intervention in Ukraine. In a press conference on 18 February 2016, Francis explained that questions like who started the "state of war in Ukraine" was a "historical problem". Nevertheless, some ROC members have questioned the orthodoxy of the Francis–Kirill meeting and ROC preparations for the 2016 Pan-Orthodox Council. [f] There are "some religious nationalists" in Belarus, Moldova, and the Russian Federation who have been "stirred into action" by the Francis–Kirill meeting and "some conservative clerics and monasteries have reacted to the" meeting and joint declaration "by ceasing their public prayers for Kirill. "[g] Kirill had reformed the administration of the ROC and consolidated authority in the ROC patriarch. According to Sergei Chapnin [ru], Kirill "has no obvious enemies in the episcopate" but some "marginal figures" in the clergy are enemies. Some ROC priests have criticized Kirill and called his acts heretical. [discuss] For example, Archpriest Vladislav Emelyanov said that the Francis–Kirill meeting "evokes a feeling of betrayal" and that Kirill was destroying conciliarity in the ROC by first replacing local synod bishops and then not consulting fellow bishops in such a serious matter. This was, in Emelyanov opinion, "clear Papism." The Eparchy of Irkutsk [ru] has called Emelyanov's statement "harmful and unreasonable." Priest Alexei Morozov said that the ROC was on the verge of a split and he encouraged ROC members to dissent in two ways: by attending "temples, where priests strictly adhere to the tenets of Christianity and do not accept heresy papacy and ecumenism" and by asking the Moscow Patriarchate to convene the Local Council of the Russian Orthodox Church to condemn what Morozov believes are heresies. According to newsru.com, the sentiments expressed by Emelyanov and Morozov are not sensationalism but exist among some members of the ROC. [h] Chapnin points out that "there exist fundamentalist groups, radically Orthodox in disposition, who condemn any rapprochement" between the ROC and the Catholic Church. Chapnin thinks that the fundamentalist rhetoric is "very emotional and of little substance." The Holy Synod of the Moldovan Orthodox Church published an appeal addressed to those who omit Kirill from their public prayers. Kirill's spokesman, Priest Alexander Volkov [ru], said these reactions stemmed from the fact that "people have not fully understood what occurred. "[i] The deputy chairman of the Department for External Church Relations of the Moscow Patriarchate [ru] (DECR), Archimandrite Philaret Bulekov [ru], noted "that the vast majority" of ROC members accepted the meeting and the results positively. Bulekov said that the ROC did not disregard the criticisms of the Francis–Kirill meeting by some Orthodox and answered most questions about what happened. Bulekov commented that in most cases the same people made critical remarks and "if not for this meeting, there would be other reasons for such statements." Metropolitan Hilarion Alfeyev told Russian News Agency TASS that critics of dialogue who consider Christian disunity to be normal hold a fallacious position against Jesus' command, in John 17:20–23, that they all may be one. Alfeyev pointed out that this command had been broken and this condition is wrong and sinful. The purpose of the dialogue is reflected in the joint statement and is not intended to overcome division and differences, according to Alfayev. Metropolitan Viktorin Kostenkov [ru] pointed out that the declaration does not contain any doctrinal agreements or concessions from Orthodoxy to Catholicism. The presence of Western saints in the Eastern Orthodox liturgical calendar, Viktorin points out, is evidence of a millennium of common doctrine. It declares a "common Christian understanding of values" together with a "desire to follow them," according to Metropolitan Mercurius Ivanov [ru], and "does not concern dogmatic matters". "It would be a great mistake," Mercurius said, "to stop conversing with each other and to throw stones at one another." ^ a b The 18th-century copy of the icon was smuggled out the Soviet Union under unclear circumstances. It was purchased by the Blue Army of Our Lady of Fátima and enshrined in Fátima, Portugal, in the 1970s.It was donated to the Vatican in 1993. In 2005, Alexy II, and President Mintimer Shaimiev of the Republic of Tatarstan, placed the icon in the Annunciation Cathedral at the Kazan Kremlin in the Republic of Tatarstan, Russian Federation. A different copy of that icon, presented by Kirill to Francis, was prominently displayed at the signing ceremony. ^ For more on the background and the earlier meetings between Popes and Orthodox leaders, see 'Pope Francis, Patriarch Kirill and the God of Surprises' by US prelate and Catholic bishop Mitchell T. Rozanski. ^ Maciej Gajek writes that although the meeting of Francis with Kirill was important, it was a political use of Kirill as a messenger conveying Putin's policy and not about faith. Gajek criticises the media, on newsweek.pl, for both failing to explain the order of precedence among the many Orthodox churches and implying that Kirill is more than just the leader of the Russian Orthodox Church. Gajek writes that the meeting was not a breakthrough in interreligious dialogue because Kirill is only the leader of the Russian Orthodox Church with no authority over other Orthodox churches; moreover, according to Gajek, there is no promise of a change in relations. ^ According to a 2015 article on jamestown.org, the Russian Orthodox Church "would cease to be the largest Orthodox denomination in the world" if it were "to lose all of its parishes and bishoprics in Ukraine." ^ For more on issues relating to the planned Pan-Orthodox Council, see 'At Last, A Council for the Ages?' by John Chryssavgis, US theologian and advisor to Ecumenical Patriarch Bartholomew. ^ There is a decades long factional "struggle between openness and reform on one hand and isolation and ultra-conservatism on the other," according to Mikhail Gorelik in 1994. The religious ultraconservatives "share a common ideology" of Orthodoxy, Autocracy, and Nationality with fascist and communist political ultraconservatives. According to Gorelik, they "see Moslems as closer to themselves than Western Catholics." Paul Goble wrote in 2015 that according to Yevgeny Ikhlov, Kirill expresses "a kind of Orthodox Fundamentalism that not only resembles the more familiar Islamist variant but like it will encourage those who want to attack modernity in the name of traditional rural values to engage in violence." ^ According to a February 2016 Russian Public Opinion Research Center (VTsIOM) opinion survey, 1-out-of-3 respondents were unaware of the Francis–Kirill meeting. Also in that survey, 62% of respondents answered that in the future, "'the two Churches should work more closely, but stay separate from each other', 8% spoke 'against cooperation or closer relations' between the two Churches, saying that they are 'incompatible and should stay such,' 10% spoke for the 'unification of the Orthodox and Catholic Churches'." Father Alexander Lucie-Smith pointed out that the February 2016 VTsIOM "survey mentions the concept of 'unification' between the two Churches. Actually, this is not on the table, and is misleading." ^ a b c d e f "Unity call as Pope Francis holds historic talks with Russian Orthodox Patriarch". BBC. 13 February 2016. Archived from the original on 12 February 2016. Retrieved 14 February 2016. ^ a b c d e f g h i j k l "Meeting of His Holiness Pope Francis with His Holiness Kirill, Patriarch of Moscow and All Russia". w2.vatican.va. The Holy See. 12 February 2016. Archived from the original on 15 February 2016. Retrieved 14 February 2016. ^ a b Alfeyev, Hilarion (25 February 2016). "Mitropolit Ilarion: o vstrechi papy i patriarkha budut daleko idushchiye posledstviya" Митрополит Иларион: у встречи папы и патриарха будут далеко идущие последствия [Metropolitan Hilarion: the meeting of pope with patriarch will have future consequence]. tass.ru (Interview) (in Russian). Interviewed by Alexander Mudrats. Moscow: TASS. Archived from the original on 25 February 2016. Retrieved 25 February 2016. ^ Alfeyev, Hilarion (11 February 2016). "Protivorechiya polnostyu ne preodoleny" Противоречия полностью не преодолены [Contradictions not overcome completely]. kommersant.ru (Interview) (in Russian). Interviewed by Pavel Korobov. Moscow: Kommersant. Archived from the original on 11 February 2016. не преодолены вероучительные разногласия. Однако целью встречи и не является обсуждение вероучительных вопросов. Во-вторых, не преодолены те разногласия практического характера, которые омрачают жизнь наших церквей. ^ В РПЦ считают беспочвенными опасения относительно возможности слияния Православной и Католической церквей после встречи на Кубе [The ROC believe apprehensions about a merger of Orthodox and Catholic Churches after meeting in Cuba to be groundless]. NEWSru (Interview) (in Russian). 17 February 2016. я хотел бы посоветовать внимательно прочитать декларацию папы и патриарха, она показывает, на какие темы шла беседа. Там не было никакой попытки вероучительного сближения или вообще даже обсуждения каких-либо догматических или богословских вопросов. И сейчас такое обсуждение совершенно не стоит на повестке дня. Декларация начинается с того, что утрата Богозаповеданного единства является нарушением заповеди Христа, прозвучавшей в Его последней первосвященнической молитве: "Да будут все едины". К сожалению, христиане не смогли сохранить это единство, христиане Востока и Запада разделены и не участвуют совместно в евхаристии. Но речь сейчас идет не о преодолении этого разделения, а о том, чтобы научиться жить и действовать в этом мире не как соперники, а как братья, чтобы вместе защищать те ценности, которые являются для нас общими, чтобы совместно проповедовать Евангелие, открывать людям Божию правду. ^ a b Alfeyev, Hilarion (17 February 2016). "Mitropolit Ilarion: vse dolzhny vstat na put primireniya" Митрополит Иларион: все должны встать на путь примирения [Metropolitan Hilarion: all must rise to the path of reconciliation] (Interview) (in Russian). Interviewed by Olga Lipich. Moscow, RF: RIA Novosti. Archived from the original on 17 February 2016. Retrieved 17 February 2016. ^ a b "Ukrainian Greek Catholics 'betrayed' by pope-patriarch meeting". hurriyetdailynews.com. Istanbul, TR: Hürriyet Daily News. Agence France-Presse. 14 February 2016. Archived from the original on 17 February 2016. Retrieved 16 February 2016. ^ a b Shevchuk, Sviatoslav (13 February 2016). ""Two parallel worlds" – an interview with his beatitude Sviatoslav". ugcc.ua (Interview). Interviewed by Ihor Yatsiv. Kyiv, UA: Ukrainian Greek-Catholic Church. Archived from the original on 16 February 2016. Retrieved 17 February 2016. ^ a b c "Kyyivskyy patriarkhat vidpoviv Papi Rymskomu i patriarkhu Kyrylu" Київський патріархат відповів Папі Римському і патріарху Кирилу [Kyiv Patriarchate response to Pope and Patriarch Kirill]. pravda.com.ua (in Ukrainian). Kyiv, UA: Ukrayinska Pravda. 16 February 2016. Archived from the original on 17 February 2016. Retrieved 16 February 2016. ^ a b c d Winfield, Nicole (12 February 2016). " 'Finally': Pope meets Russian Orthodox leader". Associated Press. Archived from the original on 16 February 2016. Retrieved 14 February 2016. ^ a b c d e f g Scammell, Rosie (10 February 2016). "Pope Francis and Russian patriarch to meet in Cuba in historic breakthrough". Prairie Messenger. Religion News Service. Archived from the original on 16 February 2016. Retrieved 14 February 2016. ^ "Pope's Orthodox mass bridges divide". bbc.co.uk. London: BBC News. 9 May 1999. Archived from the original on 15 March 2015. ^ Hitchen, Philippa (28 January 2016). "Orthodox leaders conclude Geneva meeting in preparation for 'Great Council' ". Vatican Radio. Archived from the original on 29 January 2016. Retrieved 14 February 2016. ^ a b c Russian Orthodox Church (7 June 2008). "Osnovnyye printsipy otnosheniya Russkoy Pravoslavnoy Tserkvi k inoslaviyu" Основные принципы отношения Русской Православной Церкви к инославию [Basic principles of attitude of the Russian Orthodox Church to non-Orthodox]. patriarchia.ru (in Russian). Moscow. Archived from the original on 10 October 2009. Retrieved 3 March 2016. ^ a b c Rozanski, Mitchell T. (5 February 2016). "Pope Francis, Patriarch Kirill and the God of Surprises". USCCB Blog. United States Conference of Catholic Bishops. Archived from the original on 16 February 2016. Retrieved 14 February 2016. ^ a b Allen Jr., John L.; San Martín, Inés (12 February 2016). "Pope, Russian patriarch embrace in historic meeting". Crux. Boston Globe Media Partners. Archived from the original on 13 February 2016. Retrieved 14 February 2016. ^ a b Polk, Peggy (17 July 2004). "Pope to return icon to Russian patriarch". The Tablet. London. pp. 31–32. ISSN 0039-8837. Retrieved 15 February 2016. ^ a b c "Historic encounter between the Pope and Patriarch of Moscow and All Russia". Vatican Information Service. 13 February 2016. Archived from the original on 16 February 2016. Retrieved 14 February 2016. ^ Borgia, Gregorio (12 February 2016). [Icon of Our Lady of Kazan displayed next to Pope Francis and Patriarch Kirill] (Photograph). Moscow: Sputnik (published 13 February 2016). Agence France-Presse. Archived from the original on 17 February 2016. Retrieved 17 February 2016. ^ Alfeyev, Hilarion (24 April 2005). "Habemus Papam!" [We have a pope!]. orthodoxeurope.org. Europaica: bulletin of the Representation of the Russian Orthodox Church to the European Institutions. Department for External Church Relations of the Moscow Patriarchate. Archived from the original on 11 March 2016. Retrieved 11 March 2016. ^ Alfeyev, Hilarion (17 September 2005). Can Europe breathe with one lung? Catholic-Orthodox dialogue today (Speech). 6th Gniezno Convention: "Europe of dialogue. To be Christian in contemporary Europe" held 16–18 September 2005 at Gniezno, Poland. ekai.pl. Warsaw, PL: Katolicka Agencja Informacyjna (published 18 September 2005). Archived from the original on 11 March 2016. Retrieved 11 March 2016. ^ a b Written at Bari, Italy. "Cardinal Kasper proposes a synod with Orthodox". zenit.org. New York: Innovative Media. Zenit News Agency. 26 May 2005. Archived from the original on 13 March 2016. Retrieved 13 March 2016. ^ a b c d e Yardley, Jim (12 February 2016). "Pope and Russian Orthodox Leader Meet in Historic Step". New York Times. Archived from the original on 16 February 2016. Retrieved 14 February 2016. ^ a b c Stanglin, Doug (12 February 2016). "Pope, patriarch meet in Cuba nearly 1,000 years after split". USA Today. Archived from the original on 16 February 2016. Retrieved 14 February 2016. ^ a b "Zavershilas vstrecha Svyateyshego Patriarkha Kirilla s Papoy Rimskim Frantsiskom" Завершилась встреча Святейшего Патриарха Кирилла с Папой Римским Франциском [Patriarch Kirill completed meeting with Pope Francis]. www.patriarchia.ru (in Russian). Russian Orthodox Church. 13 February 2016. Archived from the original on 14 February 2016. Retrieved 14 February 2016. ^ "Meeting with Pope was prepared in secret because of too many opponents – Patriarch Kirill". interfax-religion.com. 24 February 2016. Archived from the original on 25 February 2016. Retrieved 26 February 2016. ^ "Sovmestnoye zayavleniye Papy Rimskogo Frantsiska i Svyateyshego Patriarkha Kirilla" Совместное заявление Папы Римского Франциска и Святейшего Патриарха Кирилла [Joint statement of Pope Francis and Patriarch Kirill]. www.patriarchia.ru (in Russian). Russian Orthodox Church. 13 February 2016. Archived from the original on 14 February 2016. Retrieved 14 February 2016. ^ Chirovsky, Andriy (16 February 2016). "Called to unity". firstthings.com. New York: Institute on Religion and Public Life. Archived from the original on 18 February 2016. Retrieved 17 February 2016. ^ Minin, Stanislav (17 February 2016). "Москва и Рим сдали унию в архив: Патриарх и папа подписали то, о чем Церкви договаривались еще в 1993 году". Nezavisimaya gazeta. Retrieved 1 March 2016. Встречу патриарха Московского и всея Руси Кирилла и папы Римского Франциска, думается, назвали "встречей тысячелетия" не только из невежества. Конечно, исторической правды в этом определении нет. Папы за последние 50 лет неоднократно встречались с патриархами Константинопольскими, а взаимные анафемы были сняты еще в 1964 году. ^ a b Gajek, Maciej (13 February 2016). "O co naprawdę chodzi w spotkaniu Franciszka z Cyrylem?" [What does the meeting of Francis with Kirill really mean?]. newsweek.pl (in Polish). Warsaw, PL: Ringier Axel Springer Polska. Archived from the original on 17 February 2016. Retrieved 17 February 2016. ^ Luhn, Alec (12 February 2016). " 'Finally! ': pope and Russian patriarch meet for first time in 1,000 years". The Guardian. Archived from the original on 13 February 2016. Retrieved 17 February 2016. ^ McLaughlin, Daniel (14 February 2016). "Unease in Ukraine at church leaders' Cuba talks". irishtimes.com. Irish Times. Archived from the original on 15 February 2016. Retrieved 17 February 2016. ^ a b c Gudziak, Borys (11 February 2016). "Pope Francis and Patriarch Kirill". First Things. Institute on Religion and Public Life. Archived from the original on 16 February 2016. Retrieved 14 February 2016. ^ Goble, Paul (20 May 2015). "Moscow Patriarchate rapidly losing out in Ukraine—and beyond". jamestown.org. 12 (94). Washington, DC: Jamestown Foundation. Eurasia daily monitor. OCLC 506240142. Archived from the original on 25 February 2016. Retrieved 25 February 2016. ^ Chryssavgis, John (3 March 2015). "At Last, A Council for the Ages?". First Things. Institute on Religion and Public Life. Archived from the original on 4 March 2015. Retrieved 14 February 2016. ^ "Did the pope just kiss Putin's ring?". economist.com. London: The Economist. 15 February 2016. Archived from the original on 16 February 2016. Retrieved 16 February 2016. ^ " 'Be patient, the declaration signed on Cuba cost the Vatican a lot of difficulties', Apostolic Nuncio to Ukraine". risu.org.ua. Lviv, UA: Religious Information Service of Ukraine. 15 February 2016. Archived from the original on 18 February 2016. Retrieved 18 February 2016. ^ "Papa Rymskyy: u kozhnoho svoya dumka, khto pochav viynu v Ukrayini" Папа Римський: У кожного своя думка, хто почав війну в Україні [Pope: Everyone has his own opinion of who started the war in Ukraine]. pravda.com.ua (in Ukrainian). Kyiv, UA: Ukrayinska Pravda. 19 February 2016. Archived from the original on 19 February 2016. Retrieved 19 February 2016. ^ a b c d Russian Orthodox Church (February 2016). "Statute of the Russian Orthodox Church". patriarchia.ru (2013 ed.). Moscow. Archived from the original on 6 March 2016. Retrieved 7 March 2016. ^ a b c Chapnin, Sergei (1 March 2016). Written at Moscow, RF. " 'Heretic and traitor': fundamentalists term Orthodox Patriarch Kirill who met with Pope Francis in Cuba". asianews.it. Milan, IT: AsiaNews. Archived from the original on 2 March 2016. Retrieved 5 March 2016. ^ a b c d e f g h i "Vstrechu patriarkha s Papoy nekotoryye predstaviteli RPC schitayut 'predatelstvom'" Встречу патриарха с Папой некоторые представители РПЦ считают "предательством" [Meeting patriarch with pope considered "treachery" by some representatives of the ROC]. newsru.com (in Russian). 25 February 2016. Archived from the original on 25 February 2016. Retrieved 25 February 2016. Дело в том, что внутри Православной церкви уже довольно давно существуют группы фундаменталистски, радикально настроенных православных, которые осуждают всякое сближение Русской православной церкви и Римско-католической. ^ a b Russian Orthodox Church. Bishops' Council of the Russian Orthodox Church (3 February 2016). Постановления [Resolutions]. Council convened 2–3 February 2016 in Moscow (in Russian). Moscow. Archived from the original on 8 March 2016. Retrieved 7 March 2016. ^ Erasmus (pseud.) (6 March 2016). "Eastern Christian leaders face ultra-conservative grumbles as they prepare for a summit". economist.com (blog). London: The Economist. Archived from the original on 6 March 2016. ^ a b Bercken, Wil van den (2014). "Paradoxes and contradictions in Russian Orthodox ecumenism: an analysis of non-official publications in the 1990s". In Tolstaya, Katya (ed.). Orthodox paradoxes: heterogeneities and complexities in contemporary Russian Orthodoxy. Conference held 12–14 September 2011 at Vrije Universiteit Amsterdam. Brill's series in church history. 66. Leiden: Brill. ISBN 9789004269323. ^ Gorelik, Mikhail (10 December 1994). "Russia's divided Church". themoscowtimes.com. The Moscow Times. Archived from the original on 5 March 2016. Retrieved 5 March 2016. ^ Goble, Paul (8 November 2015). "Russian Orthodox fundamentalism recalls Islamist kind and will also lead to violence, Ikhlov says". interpretermag.com. Washington, DC: Radio Free Europe/Radio Liberty. Archived from the original on 6 March 2016. Retrieved 6 March 2016. ^ Synod of the Orthodox Church of Moldova (23 February 2016). "Ofitsialnoye obrashcheniye Sinoda Pravoslavnoy Tserkvi Moldovy k gruppe 'nepominayushchikh' svyashchennosluzhiteley Kishinevsko-Moldavskoy mitropolii" Официальное обращение Синода Православной Церкви Молдовы к группе "непоминающих" священнослужителей Кишиневско-Молдавской митрополии [Official appeal of the Synod of the Orthodox Church of Moldova to the group "nepominayuschih" clergy Chisinau-Moldovan Metropolitan Church]. ru.mitropolia.md (in Russian). Chișinău, Moldova: Moldovan Orthodox Church. Archived from the original on 2 March 2016. Retrieved 1 March 2016. ^ a b Lucie-Smith, Alexander (10 March 2016). "Ecumenical problem number one: Russians barely know what the Catholic Church is". catholicherald.co.uk. London: Catholic Herald. Archived from the original on 11 March 2016. Retrieved 11 March 2016. ^ a b "Russians consider meeting between pope, patriarch useful, support their further contacts – poll". interfax-religion.com. Moscow: Interfax. 9 March 2016. Archived from the original on 10 March 2016. The poll, which surveyed 1,600 people living in 130 populated areas, of 46 regions of Russia, was conducted on February 20–21. ^ a b "Mitropolit Viktorin: Zayavleniye ne soderzhit ustupok so storony Pravoslaviya katolitsizmu" Митрополит Викторин: Заявление не содержит уступок со стороны Православия католицизму [Metropolitan Victorin: Statement does not contain concession from Orthodoxy to Catholicism]. ruskline.ru (in Russian). St. Petersburg, RF. 29 February 2016. Archived from the original on 3 March 2016. Retrieved 3 March 2016. ^ a b "Eto ochen vazhnaya, epokhalnaya vstrecha" 'Это очень важная, эпохальная встреча' [This is very important, an epochal meeting]. ruskline.ru (in Russian). St. Petersburg, RF. 1 March 2016. Archived from the original on 6 March 2016. Retrieved 6 March 2016. Есть понимание общехристианских ценностей, которые там задекларированы, и желание им следовать. Было бы большой ошибкой перед лицом диавола [...] перестать общаться друг с другом и бросать друг в друга камни.